This easy bacon cheeseburger macaroni skillet dinner goes together in less than 30 minutes so it’s a great weeknight meal that the whole family will love. Similar to the boxed “Helper” dinners, this homemade cheeseburger casserole is quick comfort food in every bite. For some unknown reason my children like… actually like… convenience foods. My son, Chris, used to tell me that when he grew up he was going to eat nothing but Wonder Bread and NEVER eat my icky homemade bread again. Can I just say now that he is 27, in Japan, and in the Air Force he eats my icky homemade bread every chance he gets. And, just to give hope to all of your frustrated moms out there – he cooks for himself and creates very healthy meals from fresh produce, lean proteins, and the occasional bag of Sour Patch Kids. Anyway. One of my teenagers disdains the food I make in favor of heading out in the middle of the night to buy Spaghetti-Os, Ramen, and such. This child loves the food that I am sure is on the primary menu in Hell. You will not be surprised to learn that I have tried desperately to recreate these foods that the child demands – but in a more healthful manner. Really, skillet meals are pretty easy whether you get them from a box or put the ingredients together yourself. Cost-wise it is a little less, I think and time-wise? Maybe five extra minutes. So why in the world are ya buying the box? I bet you can see why it’s one of my favorites – you can use almost any combination of pastas, meats, and cheeses in this easy weeknight dinner recipe! Special diets? 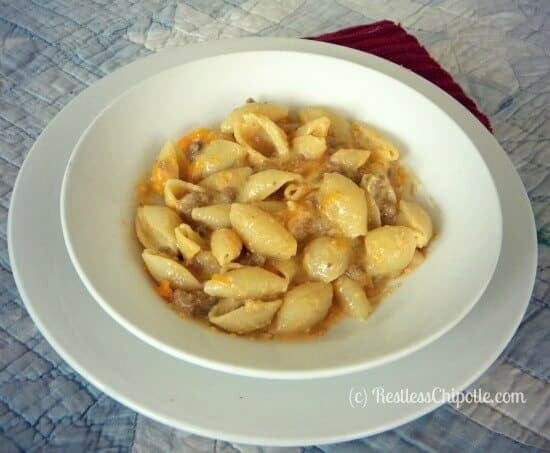 I love this gluten free pasta skillet from Taste of Home! This Bacon Cheeseburger Skillet Dinner is fast – you can put it together in less than 30 minutes. It is kid friendly. It is relatively inexpensive. AND, best of all? It doesn’t have a billion ingredients that you can’t pronounce. If you love this recipe please give it 5 stars. 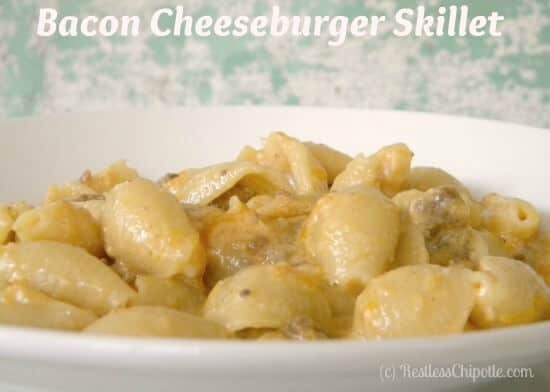 Creamy, cheesy Bacon Cheeseburger Macaroni wihout the weird additives. Although the calorie count is higher than the commercial brands the serving size is about twice as much, so keep that in mind. These are approximately 2 cup servings. Cook pasta in salted, boiling water until tender but not mushy. While the pasta cooks, cook the bacon and onions together until the bacon is crisp and the onion is tender. Pour off all but about 2 tablespoons of grease from the pan. Add the hamburger, sprinkle with salt and pepper and cook it thoroughly. Add the bacon and onions back to the pan, along with the butter. Stir until butter is melted and sprinkle with the flour. Stir in the well-drained pasta. Whisk the eggs and mustard into the milk and pour over the meat mixture. Cook, stirring constantly until thickened and well blended - about 3 minutes. You had me at bacon. Everyone always has me at bacon. Thanks for the cost breakdown–that’s an excellent way to show that it’s really not that good of a deal. Oh, and I was stationed in Misawa Japan and hope your son enjoyed his time wherever he was. He did, thanks! He is now in Las Vegas as a dedicated crew chief for the Thunderbirds… 🙂 And I know. Bacon. So much yes there to love. I am SO glad they grow out of it! This would have been even cheaper if pasta was purchased when it was on sale BOGO. I Buy extra when the good beef is on sale and buy cheese in bulk. Great post Marye! I think dry mustard needs to be in my pantry.